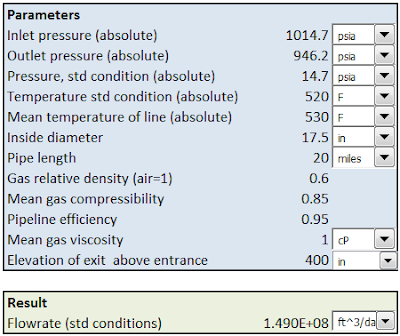 This Excel spreadsheet helps you calculate pressures and flowrates using the the Weymouth Equation, a relationship usually used in long-distance natural gas pipelines. The Weymouth Equation gives more conservative results than the Panhandle equations, and is hence more frequently used. It is valid for steady-state adiabatic (isothermal) flow. 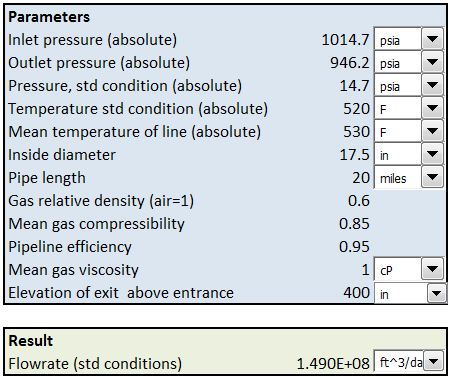 The version of the Weymouth equation used in this spreadsheet also accounts for elevation differences between the pipe entrance and exit. 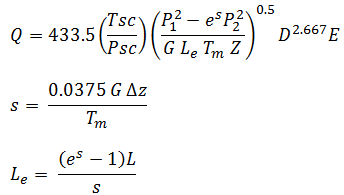 The gas compressibility Z and density are calculated at an average pressure and temperature, defined below. The equations given above use several empirical factors, and normally the input parameters would need to be specified in specific units. However, I've programmed the spreadsheet to handle the unit conversions for you. You simply specify the input units using drop-down menus.